As a passionate skater, our client Bret has beat up his fair share of “retired” skateboard decks. Despite their worn appearance, each of his old decks represented a specific time in his life and he wasn’t quite ready to let them go. Instead, Bret wanted to find a creative way to recycle them into a useful new product that he could manufacture and sell. He came up with a brilliant way to re-use and display his old skate decks— turn them into lamps! Kickr Design met with Bret, learned about his project, and provided him with a Free Project Outline & Estimate that highlighted a combination of industrial design, electronics, engineering, and prototyping services to help him achieve his project goals. With a clear path forward, we designed & built a fully functional prototype that interfaces with a skate deck and delivered it to him so he could try outfitting it to his other decks. The prototype was built and delivered within his budget, in compliance with UL standards, and with a path forward for manufacturing at scale. Bret’s new skateboard lamp prototype accepts standard light bulbs and can be mounted to any deck profile. 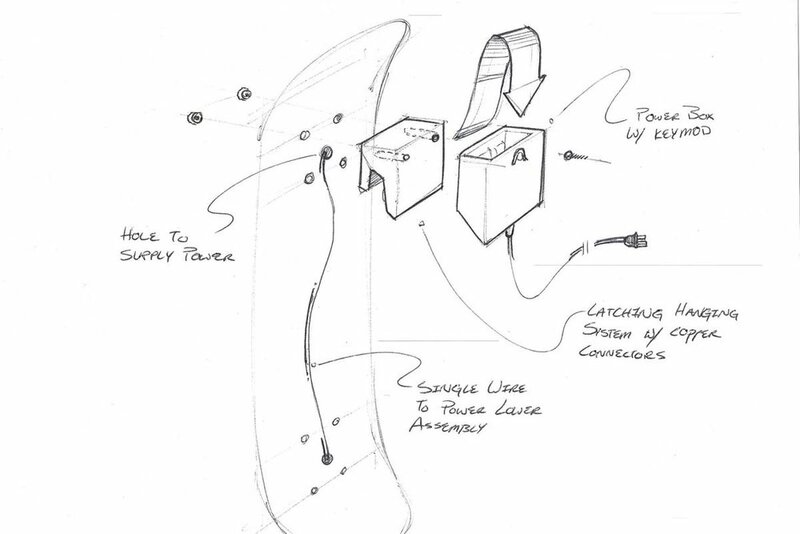 The design consists of 2 main components: sockets that look like skate trucks on the underside of the deck and a wall-mounting fixture on the reverse side. Assembly is easy— just sandwich the deck between the socket and mount components and tighten with a bolt that’s fed through the pre-existing holes in the deck. Bret saved money by using off-the-shelf UL certified components that are hidden and embedded in the 3D printed parts to keep things looking neat and tidy. Bret is stoked with his prototype and is currently moving forward with manufacturing his product with us at scale. 3D printed truck enclosure with off-the-shelf UL certified light bulb socket. Tested with LED light bulbs. If you want to bring your product idea to life like Bret did, talk to an engineer and get a Free Project Outline & Estimate.